← MEPNs class of 2016 – Let’s get ready for graduation! In the School of Nursing, the nursing faculty recognize there are many different types of students with various learning styles. Kinesthetic learning is a learning style often associated with learning by doing and learning through physical motion. The basic idea is that some people are very physical, or kinetic, which means they tend to learn most effectively when learning about things that involve physical motion or body movements. 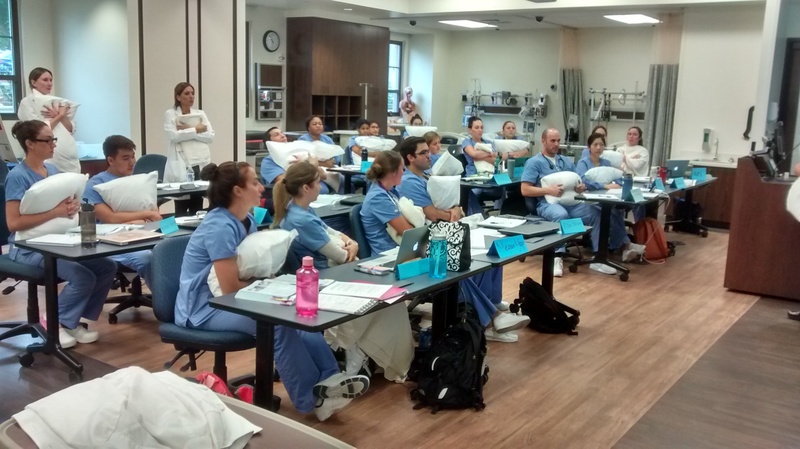 Recently, first year MEPN students were practicing using pillows on their chests, when coughing and deep breathing, to simulate splinting a fresh operative wound. By practicing on themselves in the lab they will be better able to draw on their own experience when teaching the patient in the hospital setting.